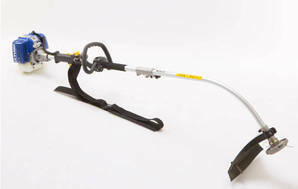 Snapshot: The Victa Tornado TTB2226 petrol line trimmer has 2 cutting lines and weighs 5.3kg. But how effective and easy to use is it? Noisy enough to need ear protection. Performance is based on horizontal and vertical trimming and long-grass cutting. Ease of use is assessed on handle comfort, shaft length, weight, balance, cutting visibility, controls, vibration, starting, line-feed effectiveness and ease of re-spooling. Price is from a September 2017 survey. We recommend petrol trimmers scoring above 85% overall. While the performance and ease-of-use of the best petrol trimmers in our tests has hovered at or above this level for a few years, battery-electric models continue to improve year on year. We raised the bar for the performance of battery-powered trimmers to 80% after a batch of 7 cordless models returned impressive performance in our 2017 test. 24 Feb 2018, Rob T.
It’s petrol powered so you can go where you want. It’s heavy, but the biggest problems are you have to be over 6ft tall to use it at the shortest setting, and it uses proprietary lines that constantly break. Each line lasts somewhere between 5 seconds and 5 minutes.